Vail’s Tess Johnson earned a bronze medal in dual moguls at the FIS Freestyle Ski World Championships in Deer Valley, Utah, Saturday night. Her first medal in her first worlds at the age of just 18. And her good friend on the World Cup circuit, Jaelin Kauf, picked up the silver. Jaelin’s parents, Scott and Patti Kauf, used to dominate the pro mogul tour when they lived in Vail in the 1990s. PARK CITY, Utah — It was a magical night on Deer Valley’s Champions moguls course. At least for Team USA. 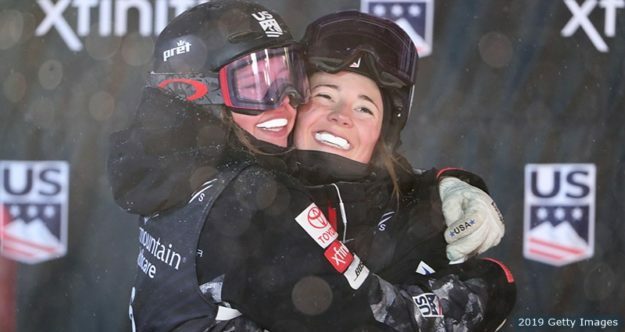 In front of a roaring J-waving crowd (big J’s on sticks, for Jaelin) and under a heavy snowfall, Jaelin Kauf and Tess Johnson — two best friends on the U.S. moguls team — beat one world champion after another in the 2019 world champion dual moguls contest. By the end of finals, Kauf claimed the silver medal and Johnson the bronze. The only world champion whom they couldn’t pass was Perrine Laffont from France who successfully defended her dual moguls world title from 2017. Laffont is also the reigning Olympic moguls champion. And Kauf, one of the fastest moguls skiers in the world, did technically beat her to the line by a significant gap in the gold-medal duel. But Perrine skied cleanly and scored more points for her two airs and her turns. Laffont’s score of 84.74 was very close to Kauf’s 82.59. It was the second world championship medal for 21-year-old Kauf — she won bronze in dual moguls in 2017 — and the first for Johnson, who’s still only 18. And the medals made up for a disappointing individual moguls competition last night, where Kauf finished sixth and Johnson 12th. With their medals in dual moguls, Kauf and Johnson kept a streak alive. American women have stood on the moguls or dual moguls podiums in every world championship since 2003. It was the first time since 2005 that two Americans have shared a world championship moguls podium and the first time ever for the women. Going up the chairlift together before their semifinal, Kauf and Johnson promised each other that they were going to have fun and give the crowd a good show. It wouldn’t matter who won. Kauf won the duel and moved to the gold-medal final. Johnson battled Yulia Galysheva, the newly crowned individual moguls world champion from Kazakhstan, for the bronze medal. Kauf and Johnson are two of the brightest young stars on the U.S. moguls team. Both women were raised in the West — Johnson in Vail, Colorado, Kauf in Wyoming right at the base of Grand Targhee, a ski resort known for its deep powder. Johnson is the granddaughter of Sports Illustrated journalist William Oscar Johnson, who brought Tess’ father with him to Vail when he covered the 1989 alpine skiing world championships. The younger Johnson stayed in the Colorado mountain town, where he eventually started a family. The Rocky Mountains were young Tess’ playground. At age 14, Johnson made the U.S. ski team — the youngest ever moguls skier named to the team. Last winter, Johnson competed at the Olympic Winter Games PyeongChang 2018, one of a handful of 17-year-olds on Team USA (she finished 12th in moguls — dual moguls is not an Olympic event yet). Skiing was a big part of the Kauf household, too. Kauf’s parents, Patti and Scott, met on the pro mogul tour (they have seven world pro titles among them). And when they had kids — first Skyler, then Jaelin — they didn’t care if they followed them into competitive bump skiing. They simply wanted their kids to like skiing. “We made an effort to instill passion for the sport and that was it,” said Scott. It was Skyler who got Jaelin into moguls — a little sister wanting to keep up with her older brother. Skyler, who played football at Ithaca College in New York and is now a campaign director for a social donation platform in Salt Lake City, was at the 2019 world championships to watch his sister. “I can actually hear his voice distinctly at the top of the course, which is pretty cool,” said Jaelin. But not tonight. The crowd was too big and too loud. And the head-to-head competition brought out the best in the American moguls skiers. Although Kauf was considered one of the favorites tonight (she won the only world cup dual moguls competition so far this season), Johnson had no expectations coming into the night. She called the snowfall magical — a fluffy white dusting that just added to the fairytale.